I have our second bedroom dedicated to my cook's library where I store all my cookbooks. 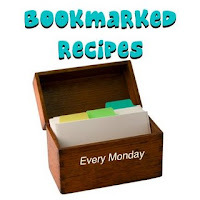 It's such a great place because all of my the cooking & baking resources are at my fingertips. Sometimes surfing the web for recipes can be a bit mundane and I find pleasure in flipping through actual books. 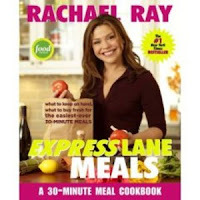 Tonight I decided to prepare a recipe from Rachel Ray's Express Meals cookbook. I'm not much of a Rachel Ray fan but I do love her creativeness in some of the dishes she has. Preheat a large skillet over medium heat with 1 tablespoon of the EVOO once around the pan. Add the chopped bacon and cook, stirring, about 2 to 3 minutes. While the bacon is getting crisp, get the leeks ready. To clean the leeks, cut each in half lengthwise, then thinly slice each half into half moons. Fill a large bowl with cold water, transfer the sliced leeks to the water and swoosh the leeks around in the water, and then let them sit without messing with them for a minute. Using your hands, skin the leeks from the water without disturbing the grunge that has settled to the bottom. Drain the leeks thoroughly, feeling them for grit. If you feel some, repeat the cleaning profess with a clean bowl of water. Don't forget to thoroughly wipe off your cutting board after chopping the leeks, otherwise the next thing you chop on the board will have sand and grit in it. Once the bacon is crisp, remove it from the skillet to a paper-towel-lined plate and reserve. Don't wipe the skill out; there is lots of bacon flavor in there. Return the skillet to the stovetop over medium heat and add the leeks, half teh garlic, the thyme, red pepper flakes, salt & pepper and cook, stirring occassionally for 3 minutes. Add the white wine and cook for 1 minute, then add the chicken stock and half and half or heavy cream. Bring the mixture to a simmer, then turn down the heat to medium low. Simmer the mixture for about 10 to 12 minutes, until tender and creamy. While the leeks are cooking, start the salmon. Season the salmon on all sides with some salt & pepper. On a plate, combine the parsley, dill, the remaining garlic, and the lemon zest. Preheat a medium or large nonstick skillet over medium heat with the remaining 2 tablespoons of EVOO. Once the oil is hot, add the salmon fillets herb side down. Cook the salmon about 2 to 3 minutes on the herb side, then turn the heat up to medium high, flip the salmon, and continue to sook for 4 to 5 minutes, or until cooked through. Add the reserved crispy bacon to the leeks and stir to continue. Divide the leeks among 4 serving plates. Top each pile of leeks with a portion of the salmon. Cut the lemon into wedges and squeeze the juice over the fish. Service with some crusty bread on the side. In a saucepan, add potatoes and cover with water. Boil potatoes until tender. While potatoes are boiling, combine the goat cheese, parsley, dill and lemon rind in a bowl. Mix everything in the bowl until fully combined. Drain potatoes when tender and place back in sauce pan. Add the goat cheese mixture and warmed cream/half & half to the potatoes. Mash and stir until combined and slightly chunky. You can add salt & pepper to taste, but I found it to be fine just from the saltiness of the goat cheese. 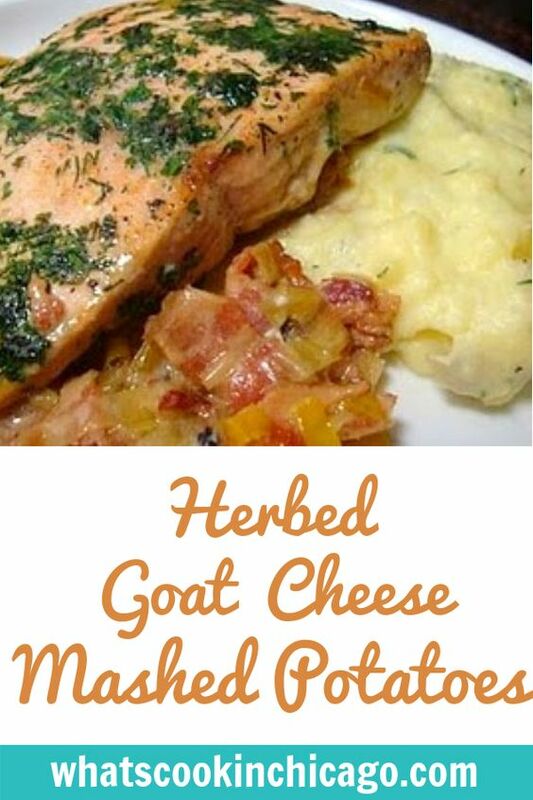 I am so glad that you posted this recipe. I can't wait to try it for ourselves. J this looks out of this world - I added it to my "to make" pile - potatoes and all - So glad you're doing recipes again, you're an incredible cook! Hope you and Louis are doing well! How are my chicago holiday windows this year I'm missing? ?